I’ve been configuring my work station. 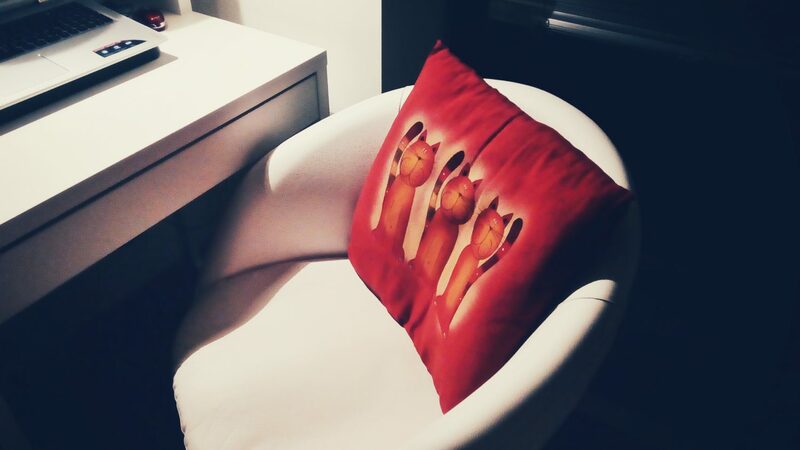 I added new software in the form of a soft kitty cushion. Given that I’m pretty much in permanent full body pain these days, I’m trying out some limited options I have to set up my work place so as to make it less conductive to the usual aches one gets from sitting at the desk. The cushion is alright to lean on, rest the back and get the arms in an easier position. It doesn’t work wonders. But it contains cats. It’s not great that it features three cats—odd numbers feel odd to me—but my live cat makes for a fourth, which is good enough for my OCD to rest in peace. Haha, nope, it didn’t occur to me to obliterate one of the cats to get down to an even number. The cushion is both nice and comfy, so I forgive it for having an odd number of cats on it. So is it the yoga causing pain? I hurt my wrist a little bit from doing full chaturanga dandasana. Learned my lesson and paying more attention to pose. First off: The “mutual friend in New Brunswick” is totally FINE now, after adjustments to work station 🙂 (with regards to the above). I’m FREE from my neck/shoulder issues, and the amount of time I spend here hasn’t changed one bit. I love your cushion. Be thankful, if it’s just even vs. uneven numbers you have OCD-feelings about! It could be a lot more complicated, if it had to be prime numbers, or Fibonacci sequences. The height of the chair/how high or low your keyboard is located is important. I constantly sat with my shoulders drawn up in an awkward position. That’s all gone now, for me. Secondly, using the iPhone as much as I do, also did something bad to my neck. I just needed to be made aware of it, so that I’m not holding my head leaning down/forward all the time. But that’s just me; and I had ‘only’ neck/shoulder issues — not full body pain. Hope you’ll get it sorted out real quick! It’s great that you got your work/play station all sorted out and that it’s bringing you no pain any more! I used your experience as a source of inspiration, actually, and tried out different configurations to see what works the best. I think I’ve figured out the best possible option now. I’m now on a chain of trips to the doctor, and I should know in mid-August what exactly is wrong with me. I have a bunch of working diagnoses for now, none of them too pleasing, but perhaps it won’t be as bad as it looks in the end. Ahh, good! So you are seeing someone. It’s very intriguing … what could it be? ?